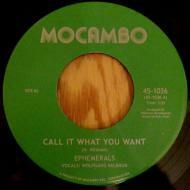 Ephemerals are a London based soul team featuring an allstar cast of musicians, founded and lead by producer Hillman Mondegreen (formerly of Hannah Wailliams & the Tastemakers). They are fronted by NYC-born singer Wolfgang Valbrun. Within only a couple of days, they recorded a stunning selection of songs to analogue tape that many critics dubbed as 'the best contemporary soul production' this side of the atlantic. The A-side 'Call It What You Want' is built around Valbrun's sincere vocals and a sinister soul groove that sounds like a lost Wu-Tang sample, the flip side "The Oligarch" showcases the band, letting loose on an organ- and horn-driven instrumental.